Those wonderful glorious feet, unfortunately kept in containers (shoes) most of the day. Poor things have quite a responsibility in both our everyday walking/living life and particularly in our yoga practice. The foot foundation is useful in both. The feet are one of the first things I look at as it’s important to see what someone is standing on all day. As a yoga teacher, I’ve learned to look first at each posture’s foundation. In the standing series, your feet are your foundation. The foot itself is made up of 26 bones all inter-relating and articulating against one another in a complex bone structure. Why so many bones in such a small area? Don’t you find it helpful that our foot is able to adapt to a myriad of surfaces and terrains such as rocky roads, a forest walk including sticks, twigs and holes in the ground? Our foot is able to mold to the ground because of the interaction of these 26 bones and then transfer the force from below up through the ankle joints and to the rest of our body in such a way that we stay balanced. The foot is foundation because it is meeting with the ground which generally doesn’t change, particularly in our yoga practice. I don’t know about you but I haven’t practiced on a particularly uneven surface in years. So we build our foundation on the ground and if the foundation isn’t right everything above has the potential to go awry. We find a similar principle with the foundation of a house. If you lay the foundation and it settles unevenly or one side drops significantly more than the other, will the windows upstairs close properly? Will the front door close properly? Our foot foundation is built on three arches, yup, you read correctly, certainly we’re almost all familiar with the one on the inside (medial side) of the foot which teachers are constantly telling us to engage but there are also two others. One of these is found on the outside of the foot although not quite as prominent. The third arch runs across the base of the toes, ever notice that your foot gets wider when you stand on it? This is the reason you measure your foot when standing, because your foot gets slightly longer along the lines of the first two arches mentioned and wider along the third. Essentially we’re standing on a triangle with one point at the base of the big toe, one at the base of the little toe and one at our heel. Connect these three points together and you get a triangle. Now take these three points and connect them to the top of the ankle joint and now we’ve created a pyramid and that my friends is a very stable structure to be standing on. The arches have 3 elements, the bone shape, the ligamentous and fascial connections, and third is the musculature in the front, back and sides of the calf. All of these together maintain the arches and create a foot foundation. A problem with any one of these structures and the arches may fall and the windows (i.e. shoulders, hips, ribs etc) don’t function as well. There are two rather important muscles surrounding the foot that are intimately tied into the arch on the medial side. They wrap around the foot like the stirrup you would get into on a horse. In fact they’re referred to as the “anatomical stirrup”. The two muscles are the Tibialis Anterior and the Peroneus Longus. 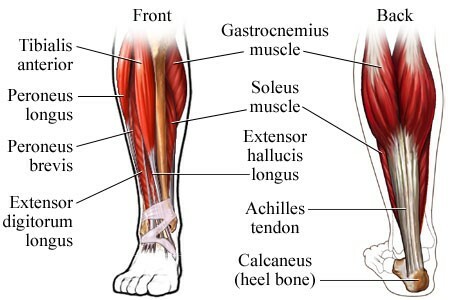 The first of these two is the same muscle associated with shin splints and can be palpated quite easily. Find your shin bone (Tibia) and move your finger over to the outside (lateral side) of the bone. Now, lift your foot from the ankle joint and you’ll feel the muscle beneath your fingers and you can also follow the muscle down and find a very thick tendon heading to the inside of your foot, right to the medial arch. The second muscle is harder to find so I’ll just describe it. It runs down the outside of your calf behind the bump on the outside (lateral) of your ankle then under your foot from the lateral side and heads across the bottom of your foot to meet up with Tibialis Anterior on the medial arch. These two muscles together become balancers of the foot and the way your arch is either drawn up or falling down in standing. There are a myriad of muscles assisting in the arches but let’s just play with these for today. Enough talk let’s take it into practice. Stand in Tadasana and become aware of where your weight is over your feet. Perhaps the weight is more on the heels or more on the toes, no need to judge where it is, just create some awareness. There are a number of ways to engage the arches, one way is to simply lift your toes. Another way that I like is to focus on pressing the base of the big toe into the ground while also pushing down with the outer back heel, the sensation is almost like your foot is getting shorter between the base of your toes and your heel. While doing this draw the awareness up the inside of the leg all the way up to the inside of your thighs and up through the psoas. Let’s look at Triangle pose for a moment. 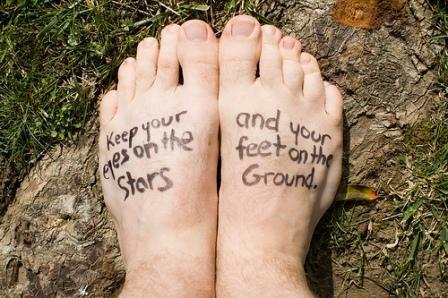 There are two feet on the ground, therefore two arches to be aware of. In the front foot we’re always told to have the knee over the ankle (great idea) but let’s play for a moment with this instruction, take your knee in slightly and carefully notice what happens to the arch in your front foot. Did you notice the arch collapsing? The back foot is a common place to find yourself with half a foot on the floor and it’s not the outside half. Play with the same instruction above for engaging the arch here. Press into the ball of the foot and the outer heel and watch your arches grow. Playing with engaging the arches in this way utilizes the interaction between the muscles discussed above. Take these simple instructions and apply them to your standing postures, develop a strong foot foundation and the pose will be much stronger and functional above it.